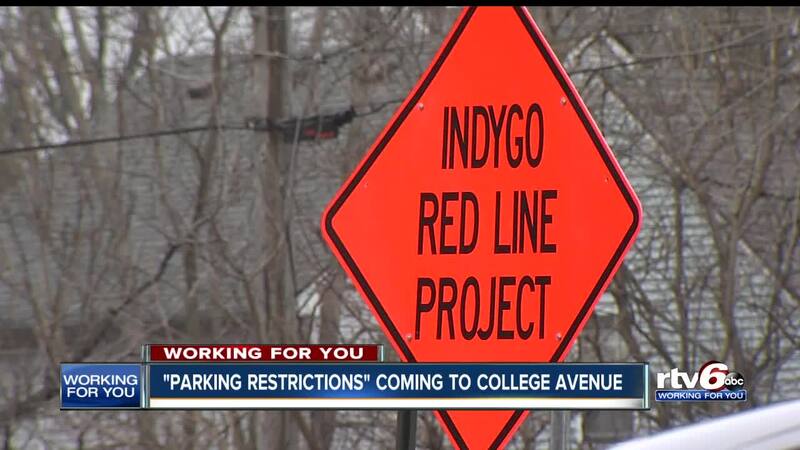 "Parking Restrictions" coming to College Avenue. INDIANAPOLIS — It can be a tough place to find parking any time but folks coming to the south Broad RIpple will soon face an even tougher battle. Red Line construction is leading to restricted parking along College Avenue. "Having no street parking around here is probably gonna make it a nightmare," Rob Walla, a local resident, said. From 38th Street to 66th Street there will be parking restriction on College Avenue starting Monday. It's being called the acceleration plan, and will result in up to 20 construction crews working simultaneously to try and get the project done by the end of the summer. Rosemary Fowler, owner of 'A Bit of Whimsy' says updates about Red Line construction have been well communicated to businesses in the area and she's happy the Red Line is coming through. "We’re looking on down the line," Fowler said. "The red line potentially can bring a lot more people in then what we’re gonna lose in parking spaces." The cost of catching the project is over three million dollars and will come from the projects contingency fund. "We’re trusting that people will continue to shop local," she said. Business owners like Fowler are just hoping it doesn't hurt them while the planners of the Red Line Project play catch up. There's a public meeting coming up this month for a full update on the Red Line Project. Click here for more information.